The iPad will play movies, surf the web, and rock your tunes with ease, but if you want to use it as a calculator, you’ll have to hit the App Store. 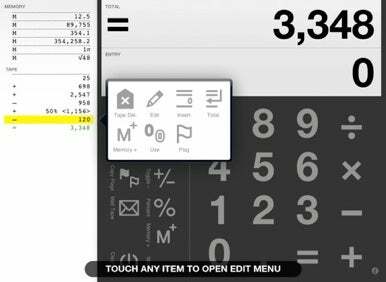 Shift Apps’s Digits Calculator for iPad is a no-frills calculator that boasts some powerful features, like a history tape that displays a running record of all calculations as you perform them, and a flag button that lets you highlight certain calculations. Recently updated to 1.2.1, Digits Calculator has received a number of improvements. The most notable new feature in version 1.2.1 is the ability to tap on any tape or memory item to bring up the tape/memory menu. The tape is a handy sidebar that keeps track of every calculation. Now, when you tap on a calculation on the tape, a new popup menu includes options to delete, edit, insert, total insert, use, or flag your selected calculation. On the calculating side, the cube root, cube, pi, and inverse functions have been added, as well as a 2 decimal format setting for currency calculations. As a final touch, sound has been added for audible confirmation of key presses. Digits Calculator is available at the App Store for $1 and runs on any iPad running iPhone OS 3.2 or later.